Yetminster scout troop is a strong section of the group and is made up of both boys and girls between the ages of 10 1/2 – 14 years. The troop meet weekly on a Wednesday evening between 7pm – 9pm during term time. The troop consists of small units of 6 – 8 scouts called a patrol, usually led by a patrol leader. Outdoor activities feature prominently, with the highlight being camping trips. Throughout the year, Scouts learn various skills, such as map reading, camp cooking and first aid in preparation to camping. 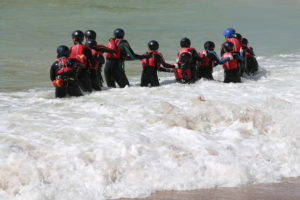 During the past year the Troop have taken part in the following activities, caving on Portland, two camping trips that included kayaking, coasteering along part of the Dorset coastline, shooting, raft building, archery, making hot air balloons, rock wall climbing, abseiling, fishing, District go cart racing competition and District swimming competitions. The Troop also take an active role in helping the local community and this has included several visits to St Andrew’s school to upgrade the outside quiet area, running stalls at local Christmas fairs, serving coffee and teas. The Scouts have attended parades in the District and this year made the oranges for the Christingle service at Yetminster Church. 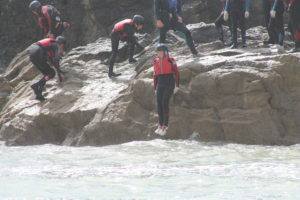 The activities that the scouts take part in and the games they play help towards earning badges.